Saturday, July 14, saw all World Class corps except those that have yet to join the full DCI Tour compete at the DCI Minnesota Premier Event at TCF Bank Stadium in Minneapolis. (Pioneer, Jersey Surf, Pacific Crest and Mandarins will join the tour this coming Saturday at the DCI Southwestern Championship in San Antonio.) Two things of note happened come the announcement of scores; Blue Devils and Carolina Crown established a fairly clear lead over the rest of the field, and Boston Crusaders bested the Cavaliers for the first time since 1978. Cavaliers, however, did move ahead of Madison Scouts and Spirit of Atlanta, two corps that had beaten them just a week ago. Also worth noting that at this very show a year ago, the Cadets placed 4th and went on to win the World Championship title. In reading the following, please keep in mind that the scores of the two Effect captions are counted for full value, but each of the scores of the three Visual and three Music captions are first divided in half, with each of those half scores then added for the Total Visual and Total Music score. Blue Devils (1st-86.30) took first in Visual Effect and all three Visual captions—Proficiency, Analysis and Color Guard. They placed 2nd in Effect Music and the three Music captions—Brass, Analysis and Percussion. Percussion took 2nd to Santa Clara Vanguard by 0.10 and the other three 2nds placed under Carolina Crown by 0.10 (Effect Music) and 0.20 (Brass and Music Analysis). Carolina Crown (2nd-85.80) took 1st in Effect Music, Brass and Music Analysis, 2nd in Effect Visual and all three Visual captions, and 4th in Percussion, 0.60 down to SCV's winning score. The Cadets (3rd-83.80) was 3rd in Effect Music, Visual Proficiency, Music Analysis and Percussion and 4th in all other captions. Effect Visual was 0.70 under Blue Devils and Visual Total was 1.05 under Blue Devils and 0.70 under Carolina Crown, while Music Total was only 0.65 under BD. Right now, the combination of the Effect Visual and Visual Total captions is primarily what's keeping the corps from placing higher. Phantom Regiment (4th-83.65) took 3rd in Effect Visual, Visual Analysis, Color Guard and Brass; in each of those captions placing one position higher than The Cadets. 4th place finishes were garnered in Effect Music, Visual Proficiency and Music Analysis; in each of those captions placing one position lower than The Cadets. However, Percussion took 7th, 0.90 under SCV's winning score. Still, Music Total was 4th, higher than SCV's 6th place finish by 0.35. Santa Clara Vanguard (5th-81.70) took 1st in Percussion, 0.10 over Blue Devils. But the next highest captions were 5th place finishes in Effect Visual and all three Visual captions, followed by 6th in Effect Music and Brass and 8th in Music Analysis, under The Cavaliers and Madison Scouts. Bluecoats (6th-81.35) were 5th in Effect Music, Brass and Music Analysis and 6th in the five other captions. Boston Crusaders (7th-78.85) were 7th in both Effect captions and Visual Analysis, outscoring Cavaliers by 0.80 in Effect Total. Brass and Percussion both placed 8th and Visual Proficiency 9th. Color Guard placed 10th. 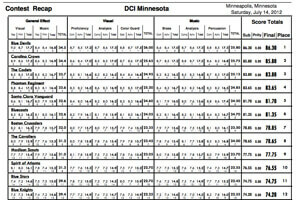 The corps' minor 0.20 advantage over Cavaliers was mostly due to minor advantages here and there, but was jeopardized by placing 0.70 down in Percussion, (accounting for a 0.35 deficit in the total Percussion score once that caption was divided in half). The Cavaliers (8th-78.65) had their brightest spot in that 4th place Percussion score, and the next highest placement was 6th in Music Analysis. All three Visual captions took 8th and Brass and both Effect captions finished in 9th. Madison Scouts (9th-77.75) took 7th in Visual Proficiency, Brass and Music Analysis, 8th in Effect Music, 9th in Color Guard, 10th in Percussion and 11th in Effect Visual and Visual Analysis. Despite being 0.90 down to Cavaliers in final score, Effect Total was only 0.20 down to Cavaliers, Total Music 0.30 down and Visual Total 0.40 down, with a 0.90 spread in Percussion (0.45 worth of the Music Total score) being the largest single deficiency between the two corps. Spirit of Atlanta (10th-76.55) took 8th in Effect Visual, 10th in Effect Music, Visual Proficiency and Analysis, Brass and Music Analysis, 11th in Color Guard, but 13th in Percussion, their line scoring under the 15th place Glassmen. Blue Stars (11th-74.75) captured 7th in Color Guard, higher than the four corps above them in total score. Effect Music, Visual Proficiency and all three Music captions placed 11th, though the Total Music placement was 12th. Both Effect Visual and Visual Analysis finished in 13th. Blue Knights (12th-74.20) placed 9th in Percussion, higher than the next three corps above them. Effect Visual and Visual Proficiency and Analysis finished in 12th, with Effect Music and Brass in 13th. The corps was 14th in Music Analysis. Crossmen (13th-72.80) had a bright spot in Visual Analysis, placing 9th. 12th place finishes in Effect Music and Color Guard were the only other captions in the top 12. Music Analysis was 13th, Visual Proficiency, Brass and Percussion all finished in 14th and Effect Visual ended in 15th, a full 1.0 under Blue Knights. The Academy (14th-72.10) had high points with 10th place in Effect Visual and 12th place in Music Analysis. Visual Analysis, Brass and Percussion all placed 15th, with Effect Music and Color Guard in 16th. The low point for the corps was 17th in Visual Proficiency. Glassmen (15th-71.35) placed 12th in Brass and Percussion, 13th in Visual Proficiency and Analysis, 14th in Color Guard, 15th in Effect Music, 16th in Effect Visual and 17th in Music Analysis. Colts (16th-70.55) were 14th in both Effect captions, 15th in Visual Proficiency, Color Guard and Music Analysis, 16th in Visual Analysis and Brass and 17th in Percussion. Troopers (17th-68.10) finished 16th in Visual Proficiency, Music Analysis and Percussion and 17th in all other captions. Cascades (18th-62.25) placed 18th in all captions. In Open Class, Legends (1st-73.50) took 1st in all captions except for 2nd in Color Guard and Music Analysis. Music City (2nd-72.10) switched all placements with Legends, outscoring Legends by a scant 0.05 in Total Music despite carrying just one of the three captions by scoring 1.10 (0.55 when divided in half) in Music Analysis. Colt Cadets (3rd-65.30) placed 3rd in all captions and Blue Saints (4th-52.05) placed 4th in all captions. Govenaires scored 72.40 in all-age competition. Minnesota Brass performed in exhibition. View the complete recap of scores from this event.